Bicycle trailers: You pay how much for gas?! Empower yourself and lessen your dependency on fossil fuel. My bicycle trailers are made using EMT, a strong, incredibly durable, thin-walled, galvanized steel tubing. Each trailer can safely carry up to 200 pounds. The weight of the trailer depends a lot on the dimensions, bed material, as well as some other factors. My trailer frames are welded using a flux-cored wire welding machine (and this is done outdoors with a fan to remove smoke and zinc oxide fumes). Aaron Forest Wieler is the clever fellow from which my design pattern originates. So why do this? 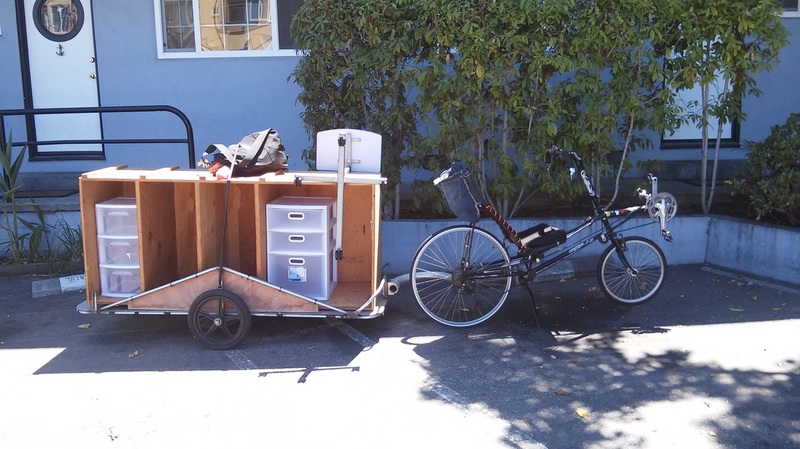 Why go to the trouble of making a bicycle trailer and pulling stuff around on it? Chances are if you came to this webpage of your own accord, you already have some great answers to those questions. For me, this is a choice I make every time I get on my bike. I could rent or buy a car, but let's be honest, I'm cheap. I don't mind breaking a sweat while huffing and puffing on a bike, pulling a trailer full of goodies here or there. It's a good conversation starter. I get a kick out of the strange looks I get. Strangers come up to me with questions and compliments. It brightens my day. And of course I'm doing a favor for the planet, which anyone with any sense at all, knows is desperately needed. Climate change is a real thing, people! Wake up and smell the foul exhaust blasting out of that tail pipe. It's high time we wise up and find a smarter way to get around.